I’m completely addicted to potatoes, and even more to potato salad! 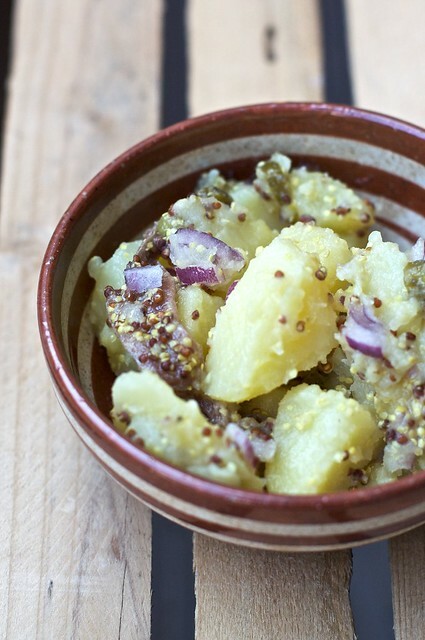 In its simplicity a potato salad can become the real protagonist of a meal. Although I love the simple pleasure of boiled potato dressed just with extra-virgin olive oil, salt and chopped parsley, over the years I developed a more complex (at least for an Italian) version of the basic potato salad. Boil the potatoes. I normally start with cold water and washed unpeeled potatoes: I lay the potatoes in a big saucepan, I fill it with water and put to boil. The cooking time depends of the size of the potatoes: the bigger the longest. Pick them with a knife to check if they are cooked. Once potatoes are cooked, drain them and let them to cool slightly. In the mean while chop the shallots, rinse the capers, drain the anchovies. Peel the potatoes and cut them in big mouth pieces. Add everything to a big bowl. In a little bowl mix yogurt, mayonnaise and mustard. Add the dressing to the potatoes and serve. Potatoes do not refrigerate well, so cook them on the same day you intend to eat them and dress them at the last moment.